What is Infosys’ Greatest Contribution? On 18th May, 2011 when Infosys published its ‘30 Years of Infosys : Annual Report 2010-11’, its founder and chairman Mr. N. R. Narayana Murthy also laid out its path for future journey. 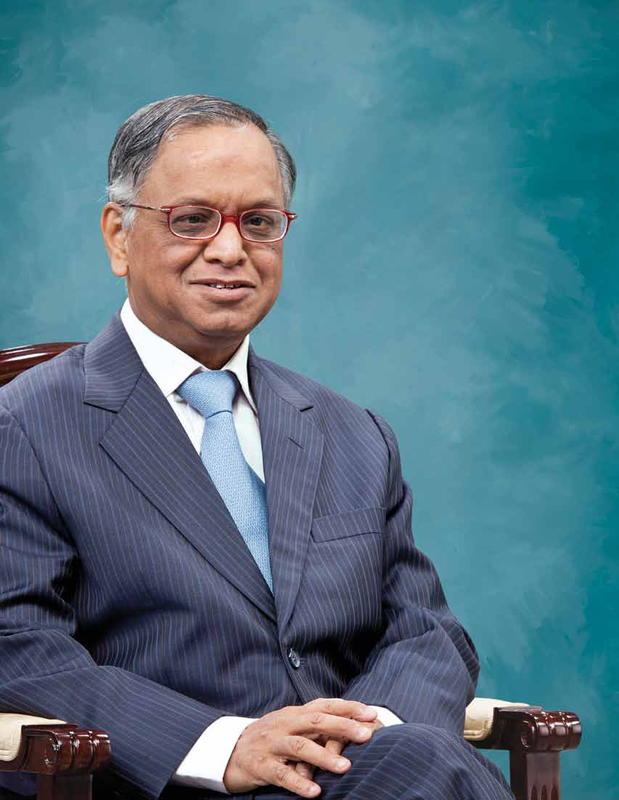 Murthy is stepping down as non-executive Chairman and Chief Mentor on August 20 this year when he turns 65. And, above was definitely the news which made the headlines. BUT in this article ‘Goodbye, folks. March on with values...’, he also reflects upon the marathon called ‘Infosys’ and leaves a glimpse of its DNA. When the company ‘Infosys’ was started, they decided the respect from every stakeholder (customers, employees, investors, vendor-partners, government of the land and the society) as the primary objective of the company. They distributed 27% of the company’s equity among their employees and always considered the idea of sharing wealth to be an important part of their social responsibility. They aspired to become leaders in corporate governance. They had a profound belief in Quality. They were India’s first software company to be certified at Level 4 of the Capability Maturity Model of the Software Engineering Institute at Carnegie Mellon. They established a corporate vision --‘"We will be a globally respected corporation." They were the first Indian company to get listed on the NASDAQ. Opening their ultra-modern offices in London, Paris, New York, Melbourne, Shanghai and Tokyo heralded their aspirations to be a global company. They had a long-held belief in the importance of education and research. They refused to accept unreasonable terms and walked away from business with a Fortune-10 company which was a test of their resolve. They highly revered their code of ethics and accepted the resignation of a senior colleague and dealt with the instances where their code of ethics was jeopardized--again tests of adherence to their values. What have been the lessons from this extraordinary marathon? Assembling a team of extraordinary people who have displayed outstanding capabilities through their value system, competence, low ego and high energy is crucial to the progress of any institution. The differentiation comes from ideas, and ideas come from bright minds. Therefore, good people are the primary assets of a great organization. It is essential to realize that even the best people may not be able to run the entire marathon. Different people run out of endurance and intellectual horsepower at different points of time. Some people drop out of the marathon since they do not see any value in an organization when their own time under the arc light is over. A leader’s responsibility is to recognize this, provide them opportunities outside the organization, and usher in suitable replacements. Many intelligent people possess a high ego and low patience to deal with people less capable than themselves. Leaders have to manage this anomaly very carefully, counsel these errant people from time to time, and allow them to operate as long as they do not become dysfunctional and start harming the organization. If they do cross the threshold, it takes courage to inform the individuals that their time in the organization is over and that they have to leave. However, one aspect that marks out a truly superior organization is the ability of its employees at all levels to be driven by values and to ensure adherence and compliance under any circumstance. No individual is high or important enough for an organization to put up with non-compliance. Leadership by example is what creates trust in people to follow a leader. As long as a leader is able to show his or her sacrifice and commitment to a cause, others will follow him or her. A sense of ownership among employees is extremely important to build a long-term future for a corporation. Such ownership comes from fair, merit-based and generous sharing of wealth and perquisites among each member of the company. Strategy is about ensuring sustained differentiation in a changing environment for better net income margins. Differentiation without better net income margins is meaningless. In their opinion, operating margins and earnings before taxes, depreciation and amortization (EBITDA) are not appropriate measures. In fact, the best measure of differentiation is the per-capita free cash flow generated. Such cash flows bring cash to invest in better people, research and development, infrastructure, training, and better customer and employee confidence. The most important factors that differentiate a corporation from its competitors are : an enduring value system, open-mindedness, a pluralistic and meritocratic approach, and practicing speed, imagination and excellence in execution. Leaders have to focus on creating such an environment. Leadership is about taking bold and firm decisions with incomplete information in an environment of uncertainty. Leaders who waffle do not inspire confidence in their people. It is important to use as much data and modeling as possible to eliminate clearly bad decisions. Their decision to walk away from a Fortune-10 company when they contributed 25% of their revenue was one such example of decision making under uncertainty. It was a tough decision that was taken very calmly and firmly with a composed mindset. Every leader must have a mental model of his or her business with at best five to seven parameters that determine sensitivity to revenue and net-income. It is important to update that model suitably as the business landscape changes. Any leader who cannot quickly do such sensitivity calculation would not be able to take quick and bold decisions. Every day, you carry and update the mental model of your business in your mind. Generosity is an essential part of a leader. It is the foundation on which teamwork is built. The ability to share the limelight with one’s colleagues, the ability to step aside and give opportunity to younger people when they want that fame, power and glory, and the ability to provide a safety net of advice for them is an important aspect of strengthening the future of an organization. It is not easy to give up power, particularly when you have been the object of so much adulation. Scalability is the true test of the endurance of an organization. The ability to grow successfully without losing quality, productivity, employee, investor and customer satisfaction and the spirit of a small company is what makes Infosys a great company. Innovation is the best instrument for creating sustained differentiation. However, it must be accepted that revenues for a corporation come from well-understood ideas and business models. For example, most of a bank’s revenues will come from borrowing money at a certain rate and lending it at a higher rate. Part of the profits from such models will be used for research and development to generate new ideas. A few of these ideas will be seeded and some of them will become mainstream revenue earners. Therefore, it is very important for a leader to focus on innovation, particularly, when the times are good. Customers put food on our table. Therefore, we have to have a laser focus on exceeding their expectations, being open and honest with them, and ensuring that they look good in front of their customers. Employees are the only instruments we have to make our customers and investors succeed. Therefore, we have to create an environment of openness, meritocracy, fairness, transparency, honesty and accountability amongst our employees. Our investors understand that businesses will have their share of ups and downs. They want us, the management, to level with them at all times. Therefore, “when in doubt, please disclose” is a good policy for a corporation. Society provides customers, employees, investors, bureaucrats and politicians. Therefore, earning the goodwill of every society that we operate in is extremely important for us. Global benchmarking is a powerful instrument that helps us to improve our self-confidence, compete with the best global competitors, and serve our customers better. Kindly use 'Add Comment' section, if you feel that your comment stands at its own. In case, you wish to reply to the comment(s) made by other users of the website, you may use the 'Reply' options given underneath each comment. Luminis Consulting Services promotes a receptive, transparent and civil atmosphere for comments and users. Critical, in-depth and intelligent discussions and debates are encouraged and the best of these are highlighted in various ways, such as Homepage display etc. Everyone is welcome and encouraged to voice their opinion regardless of identity, politics, ideology, religion or agreement with other community members, the author of the post or staff members as long as those opinions are respectful and constructively add to the conversation. However, this community does not tolerate direct or indirect attacks, name-calling or insults, nor does it tolerate intentional attempts to derail, hijack, troll or bait others into an emotional response. These types of comments will be removed from the community where warranted. To maintain a civil atmosphere, our moderation team may read comments before they are displayed to other users, as we strive to get to all comments as quickly as possible. However, Luminis Consulting Services reserves the right to add, delete, edit or act upon the comments made by any user. Thanks!